Line of Duty: the BBC hit is coming to Hulu. Watch it. Line of Duty and the rise of international TV. Hulu was created by U.S. networks as a TV catch-up service, but lately its most striking feature is international content. While the site has long been home to subversive, quirky, and sweary foreign fare, this summer Hulu added more prestigious imports, including Rev., a deceptively gentle British comedy about an inner-city clergyman; The Yard, a Canadian mockumentary the Toronto Sun dubbed a “kiddie Sopranos”; and Prisoners of War, the Israeli drama that inspired Showtime’s Homeland. Line of Duty certainly manages that, starting with the screams, gunshots, and confusion of a botched anti-terrorism raid. A stupid mistake leaves the wrong man dead and a senior officer ordering the policemen involved to cover up their mistake. When Det. Sgt. Steve Arnott (Martin Compston) refuses to lie, he’s forced out of the tight-knit world of counterterrorism and ends up in the mopey copper’s last, lonely holdout: the anti-corruption squad. Arnott’s new boss, Superintendent Ted Hastings (Adrian Dunbar), directs him to investigate a confident, charismatic cop named Tony Gates—played with irresistible charm by Lennie James—whose team boasts the area’s best clearance record. Is the by-the-book Hastings simply jealous of Gates’ success? Is Hastings—who thinks he suffered more discrimination than Afro-Caribbean Gates while growing up in sectarian Northern Ireland—just another racist cop? And are the accusations against Gates—adding extra charges to successful prosecutions and dumping hard-to-solve crimes on other teams—really all that serious? That’s when Line of Duty becomes television’s most exciting exploration of the world’s dullest subject: bureaucracy—which, the show proves, can be fascinating. Mercurio created the series in part to challenge the notion, reinforced by traditional cop shows, that the police investigate all the serious crimes that come their way. In fact, as he wrote in the Guardian, police in Britain “routinely drop one in three reported crimes because they are under pressure to concentrate on cases that can be solved within a workable timeframe by workable manpower.” Throughout the five episodes, smart police work is constrained by unreasonable rules and regulations. 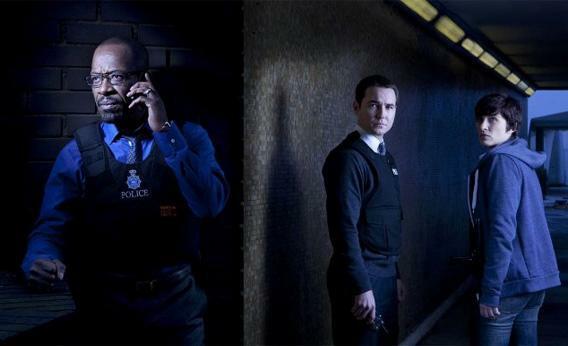 Don’t worry, though: Line of Duty isn’t all data-mining and office politics. The detectives are dragged away from their computers to investigate a gang that’s dropping fingerless bodies around a grim housing estate full of feral kids. With their two-score of episodes to fill, American series rarely pull off consistently thrilling cliffhangers, but Line of Duty manages four genuine fingernail-chewers. And even after it’s clear that Gates is no saint, his motivations—especially his conflicting loyalties to friends, lovers, and family—are so convincingly expressed that he somehow manages to retain viewers’ sympathy. Watching Arnott put in mind-numbing hours paging through files and clicking through databases in London, it’s impossible not to think of The Wire’s Lester Freamon and Roland “Prez” Pryzbylewski toiling over their wiretaps in Baltimore. It’s a reminder that television has become more global. Although U.S. networks have been importing and “translating” British shows since the days of All in the Family and Sanford and Son, contemporary viewers have more access to both original inspirations and subsequent interpretations. Not long ago, a diehard Homeland fan might have learned it was based on an Israeli series, but would have had no way of seeing the original. Now she just has to call up Hulu. Unfortunately, U.S. television is downright unfriendly to short series like Line of Duty, no matter how good they are. By the time they find an audience—if they find an audience—their twists and turns have already unspooled, and it’s time for a new show to take up residence. What’s more, the “adult language” that often appears in British shows—sometimes with breath-taking frequency—can relegate them to graveyard time slots. It’s insane that scheduling snafus deprive U.S. viewers of high-quality television. But as more people acquire devices that allow them to watch on the big screen, Hulu, and other services like it, may help viewers reimagine what television can do.